The holidays can be a fun and festive time, but they’re often not as fun as they could be if you’re Selling During the Holiday Season. Working some easily interchangeable decor around a streamlined and beautiful overall design can create a space where you and your family can enjoy a spooky Halloween all the way through a glittery New Years and still be ready for last minute showings. No matter what season, the essence of staging a house remains the same, namely clearing out all clutter, deep cleaning every corner and cabinet and smelling fresh. Often the easiest place to start is by tossing or giving away items you no longer want, or don’t want enough to move and putting non-essential items into storage. The idea is to clear out absolutely everything that you won’t need in daily life, no clutter means prospective buyers will be able to picture themselves there and not get distracted by seeing your stuff at every turn. Paring down furniture and decor can be difficult, both the idea of removing your belongings while still living there, to the energy it takes to pack them away early. Viewing it from the perspective that you’ll have to either get rid of them or pack these same items at some point anyway can make this process easier to manage and your home one step closer to being ready to list. After everything has been cleared out or packed and moved to storage, time to make the whole house shine. Scrub every square inch clean and organize every drawer, shelf and cabinet. Make sure furniture is well placed throughout the room, not too far apart or too close. Aiming to comfortably fill the room is also a better idea than pushing everything to the walls and corners. Staging and designing a room can be tricky to fit around busy schedules, luckily there are places to turn if you might need extra help or inspiration like online interior design services, your Real Estate Agent’s advice and looking at home magazines. 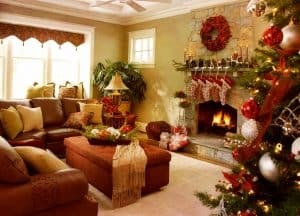 Some safe bets to bring some festive warmth into each room, no matter what holiday is around the corner, are fresh flowers, gently scented candles and a throw blanket for the sofa. These are always great ways to add some depth and charm into a room and create a consistent base design for you to add to with more seasonal decor. A new outdoor welcome mat and a simple wreath for the front door and maybe a few pumpkins or decorative lantern can take care of the exterior design. For those that have outdoor space like a patio, deck or porch that help add value to the property, take a moment and look for ways to carry these same small decorations in each area so they look tied together in their designs. Even though all your personal knick-knacks, pictures and memorabilia should be moved out with the rest of your non-essential items, small and tasteful decor can make a space not only look more beautiful, but help give buyers a feeling of what the room could look like if they lived there. Accent pillows for sofas and armchairs all in the same fabrics and coordinating colors like greens, grays or white can work from October through January. Understated leaf or evergreen centerpieces for dining tables and garlands draped across fireplace mantels help celebrate throughout autumn and winter, without adding distractions. Kitchens can be tougher, but themed tea towels or spoon rests within reason can be fun additions. Staging is definitely a time when less is more, and thankfully these types of decor can transition with the most ease are also typically reasonably priced and available in a wide range of styles. Just remember to try and stick to the most unobtrusive items and stick to the same colors for each occasion, so when you swap them out the design stays cohesive. Perhaps the toughest part of staging your house while you’re still living there during the holidays is curating what personal family traditions, decorations and devotional items to display. It is still your home, but the rules of staging remain the same and buyers will be more likely to appreciate your house when they aren’t only able to see the family still living there. Closer to the end of the year, try and select only the smallest tabletop pieces to enjoy or have a closet where they can be easily stored during showings and open houses. Choose Christmas trees that don’t take up too much floor space, keep all gifts stored away (for looks and security!) and only use a single, simple wrapping paper. If you feel strongly about including a larger item or display, work with your Real Estate Agent to find what might best fit your needs and house. No matter what time of year, even with careful staging sellers might need a bit more guidance from a Realtor or Real Estate Agent. Figuring out how much your home is worth with a professional can help you plan out the best ways to maximize your return from staging efforts, needed improvements and investments before listing.